Just saw this ad on Flickr (posted by Evil Petting Zoo 42). 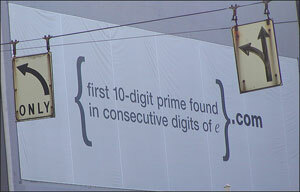 If you’ve never seen it before, it appeared on a billboard in Silicon Valley in 2004, evidently bearing a math problem (and not an easy one). Suffice it to say that “e,” in mathematics, is the limit of (1 + 1/n) to the n, as n tends to infinity. Its value is around 2.718281828459045235. Finding the first 10-digit prime number in consecutive digits of e would seem to be a difficult task, but some math whizzes managed it (one after writing “a little python script”). Adding “.com” to their answer led them to a Web site that displayed an even tougher math problem. Solving that one sent them to yet another site, which explained the ad. It was a recruitment effort by Google to find engineers—the second site was a job-application site. If you got both problems right, you could apply for a job with Google. “We’ve always worked hard to hire the smartest engineers we can find, and we thought this would be a cool way to find a few more. Perhaps including you,” Google wrote on its blog at the time.